Good afternoon. I am delighted to be here with you today. This is my first visit to Jakarta, the fast-beating business and cultural heart of Indonesia, and my fifth ASEAN country visit since taking office on July 1 last year, signaling the growing ties between Hong Kong and Indonesia, against the backdrop of an enhanced relationship between Hong Kong and the ASEAN region. Just now I had a very constructive meeting with President Jokowi. It was actually our second meeting since we last met in Hong Kong in May 2017, at that time I was the Chief Executive-elect. In the year or so between our two meetings, I am glad that so much has been achieved by the two governments in terms of collaboration, and our bilateral ties have grown even stronger. While the President was in Hong Kong last year, he witnessed the signing of a Hong Kong-Indonesian MOU on cultural co-operation and a joint statement on labour co-operation. A month later, our two economies signed an agreement on the automatic exchange of financial account information for tax purposes. In July, our Financial Secretary, Mr Paul Chan, visited this fast-rising global city to officiate at the formal opening of Hong Kong's newest Economic and Trade Office - our 12th in the world and second in ASEAN. The mission of the Jakarta Office, headed by Mrs Do, like that of our other Economic and Trade Offices, is to expand economic and trade ties between us, and to create opportunity for both of us. Last November was particularly gratifying. The Financial Secretary officiated at the inauguration ceremony of the Indonesian Chamber of Commerce in Hong Kong. And, after three years of negotiation, Hong Kong and the 10 member states of ASEAN - of which Indonesia is a founding member - formally signed a free trade agreement and related investment agreement. These two agreements cover trade in goods and trade in services, as well as investment, economic and technical co-operation and dispute-settlement mechanisms. They are, in short, comprehensive in scope. They will bring legal certainty and heightened market access in trade and investment to our respective companies. They will create new opportunities for business and bolster trade and investment flow between Hong Kong and ASEAN, including, of course, Indonesia, which represents over one-third of ASEAN's collective GDP and over 40 per cent of its population. Indonesia is home to the ASEAN Secretariat, which is an important reason behind the establishment of our ETO here in Jakarta. After all, ASEAN is Hong Kong's second-largest trading partner, with bilateral trade in goods last year between Hong Kong and ASEAN totaling more than US$120 billion, up 12 per cent over the previous year. Our trade with Indonesia was also strong last year, up nearly 8 per cent over 2016, to US$5.4 billion. Let me add that Hong Kong is a major source of foreign direct investment in Indonesia. In 2017, we were fourth in Indonesia's FDI, with an amount exceeding US$2 billion. Adding it up, I would say we have come a long way in a short time. I would say, too, that we have only just begun to tap the opportunities between Hong Kong and Indonesia, and between Hong Kong and ASEAN as a whole. The opportunities exist not only in trade and investment, but also in culture, in education, in travel and in forging a closer people-to-people bond. Consider, for example, the rise in Indonesian visits to Hong Kong. Last year, we welcomed more than 480 000 Indonesian tourists to Hong Kong, up more than 40 per cent over a decade ago. That should not be surprising as Hong Kong is an attractive and enticing international city for people from around the globe. Ours is a distinctive blend of East and West, a mix of global and local offerings - and in everything from fashion and food, arts and culture, to leisure and entertainment. Ladies and gentlemen, that is also a reflection of our "One Country, Two Systems" framework. It rewards us with powerful, and ever-deepening, ties to the Mainland economy, while leaving us free to pursue global prospects. Hong Kong enjoys the unparalleled advantage of being part of China, while maintaining our unique strengths in the rule of law, independence of the Judiciary, our capitalist system, rights and freedoms, etc, all enshrined in the Basic Law. Not surprisingly, Hong Kong is one of the best places in the world to do business. For the past two years, Hong Kong has been named the most competitive economy in the world by Switzerland's International Institute for Management Development. The Washington-based Heritage Foundation has named Hong Kong the world's freest economy for 24 consecutive years. And, in the World Bank's "Doing Business 2017" report, Hong Kong finished fourth for ease of doing business out of nearly 200 economies. Hong Kong's tax regime has always been rated highly in those global rankings. Our tax regime has always been low and uncomplicated by global standards, but we are not complacent. Since my taking office as the Chief Executive, my government has been working to make our tax regime even more competitive. A two-tiered profits tax system has been put in place since the beginning of April this year. Our profits tax rate has been lowered to 8.25 per cent for a company's first HK$2 million, that is US$256,000, in profits, while our standard tax rate is only at 16.5 per cent and that standard tax rate will apply to profit exceeding the HK$2 million amount. And to encourage corporations to invest in research and development, we are putting in place "super deductions", that is, a 300 per cent tax deduction for the first HK$2 million in eligible R&D expenses, with the remainder at 200 per cent. Financial services is another strength. Just last month, the London-based Global Financial Centres Index, a semi-annual ranking of the world's top financial centres, rated Hong Kong third, behind only London and New York. In the Index's "Human Capital" category, Hong Kong finished first. We are China's international financial capital, and have the first-mover advantage in the Mainland's continuing economic reforms. Hong Kong has long been the world's largest offshore Renminbi business centre. And our financial services strengths, our capital-raising expertise and related professional services know-how, will make key contributions to the development of our country, and help power the far-reaching Belt and Road Initiative. I do not have to tell Indonesia about the Belt and Road Initiative. 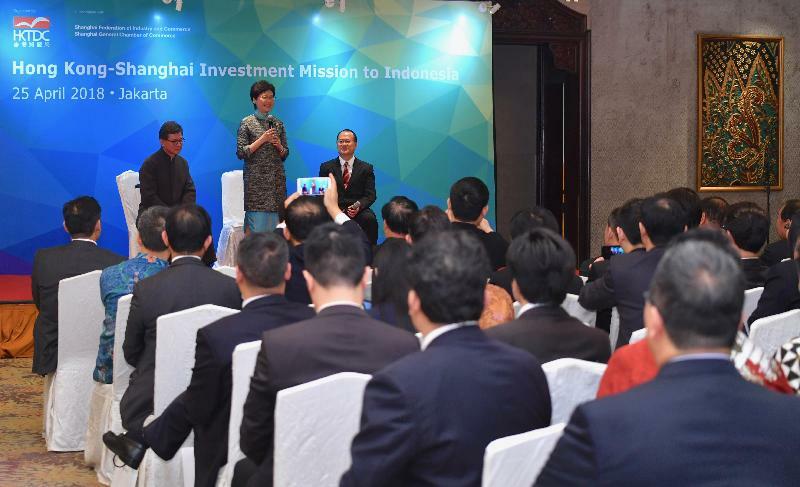 Indeed, this plan was first proposed by President Xi Jinping in 2013, right here in Jakarta. I know Indonesia, with its strategic location and fast-growing economy, supports this strategic initiative, alongside many other nations across different continents. Built on multilateral co-operation in infrastructure, in trade and investment, in culture and in people-to-people bonds, the Belt and Road Initiative will rise as a global economic force deep into the 21st century. The member states of ASEAN are poised to play a key role and benefit from it. 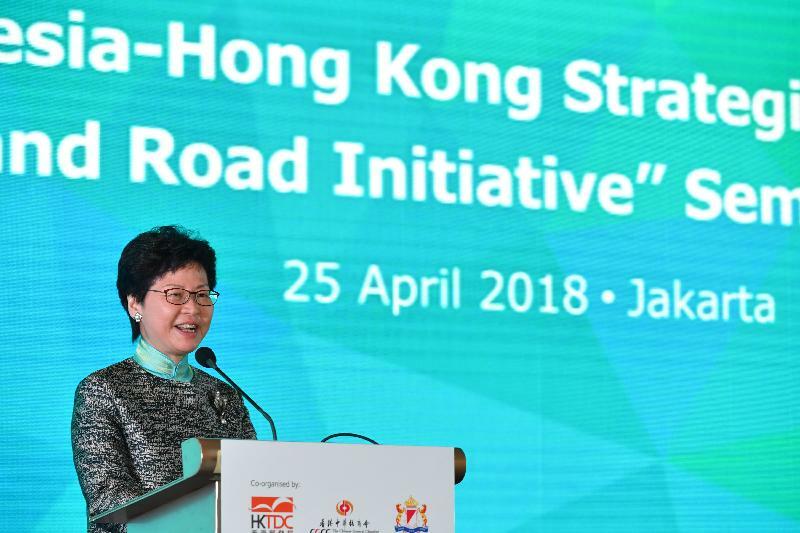 And with the Central People's Government's support, Hong Kong can contribute to each of the five areas of connectivity under the Belt and Road Initiative. This is already well illustrated in two successful Belt and Road Summits organised by the Hong Kong Trade Development Council in 2016 and 2017 and another Belt and Road Seminar held at the Great Hall of the People in Beijing in February this year in conjunction with the newly established Belt and Road General Chamber of Commerce. Given the significant Muslim population along the Belt and Road, Islamic finance will surely expand as the big-ticket infrastructure projects find traction. In this, Hong Kong can also offer its services. Over the past years, we have issued three international sukuk or Islamic bonds. Each has been a success. Each is a testimony to global investor confidence in Hong Kong's financial services experience and economic fundamentals. Alongside the financial sector, we take pride in our services professionals - world-class engineers and surveyors, architects, designers and planners, together with specialists in insurance, arbitration, risk management, project consulting and communications. They have much to offer Indonesian businesses looking to find the fast lane of the Belt and Road. At the Boao Forum for Asia earlier this month, President Xi Jinping announced a series of measures for the further opening up of China. I believe two will prove particularly beneficial to Hong Kong and the companies that partner with us. One is further relaxation in financial services, especially in insurance. The other is President Xi's pledge to provide a more attractive investment environment in the Mainland. In both cases, Hong Kong has what it takes to make a difference. Then there is the Guangdong-Hong Kong-Macao Bay Area development. This development is now being taken forward as a national strategy and the detailed Development Plan will be promulgated very soon. With a collective population of 68 million, and a combined GDP of some US$1.5 trillion, the Bay Area is destined to rise as a global centre for finance, high-end services and innovation and technology. Ladies and gentlemen, I have quickly outlined Hong Kong's advantages, and the many opportunities in front of us. By this I mean not only Hong Kong, but our friends from Indonesia and ASEAN. But I believe, I personally believe, the best of Hong Kong is yet to come. So let me end by showing you a three and a half minute video on our bright future. For those Hong Kong friends who have seen this video previously, this is a newly updated version, which is shown for the first time, right here in Jakarta.